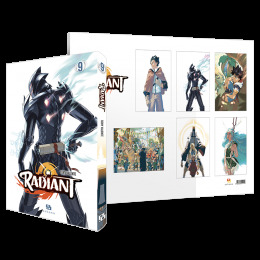 Stuffed toys, T-shirts, posters… Find all the tie-in merchandise from the Radiant universe! 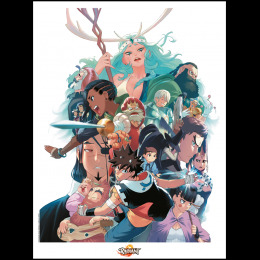 Having already published the DOFUS manga – which has been a considerable success, with over a million copies sold – Ankama continued on the path of creating manga and discovering French talent with the launch of Radiant in 2013. Quickly successful among French readers, the series also became popular in Japan – a first for a manga made in France! Anointed by the master mangakas Hiro Mashima (Fairy Tail) and Yusuke Murata (One-Punch Man), Tony Valente witnessed his series being published directly in Japanese, without any prepublication. 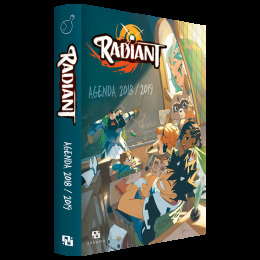 Chosen by NHK, the top public broadcaster in Japan, Radiant was adapted into an animated series as early as October 2018. Seth is an aspiring sorcerer from the Pompo Hills region. Like all sorcerers, he's an Infected, one of the rare living things to have survived the Nemeses, creatures from the sky that contaminate and decimate everything they touch. His apparent immunity led him down a path he seemed destined to follow – fighting the Nemeses. 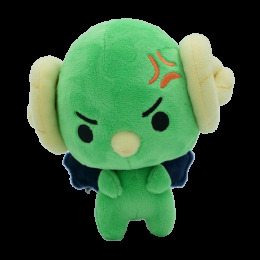 However, fate and his "bravitude" will take him in over his head on a quest to find the Radiant – the Nemeses' nest – and destroy it so the Infected may live in harmony with the rest of the world. 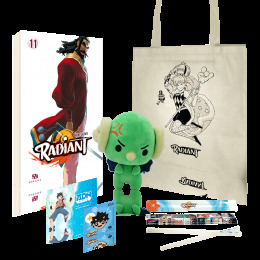 This pack contains:* - Radiant Volume 1 - a Seth pin, - a Radiant wand, - a Mélie tote bag, - a Mr. Boobrie stuffed toy, - and a card from ADN giving you one month free when you subscribe to ADN (Anime Digital Network)**, so you can watch the Radiant anime! * Act now – supplies are limited! ** See animedigitalnetwork.fr for conditions. 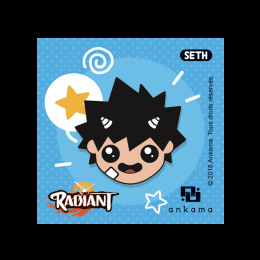 After the manga and animated series, Seth, the sorcerer created by Tony Valente, is now available on a pin. 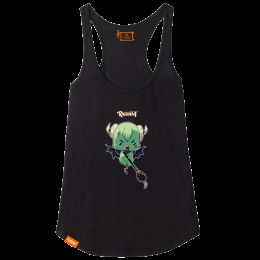 This is a kawaii version that reflects the iconic character's features. This reproduction is printed on superior quality paper by Images Dérisoires, specialists in poster art. Tony Valente's flagship series is bringing you a new collection of merchandise. 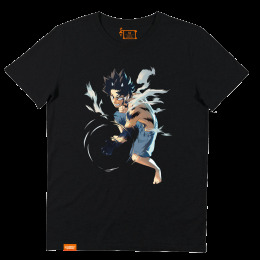 You'll be radiant with these T-shirts and tote bags from the shonen manga made in France! 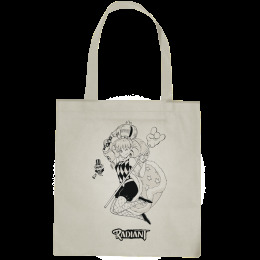 Toss out that plastic shopping bag and grab this tote bag adorned with the young witch Mélie! 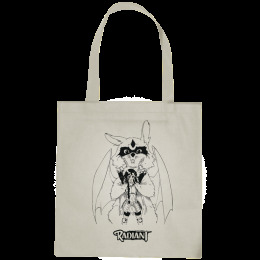 Toss out that plastic shopping bag and grab this tote bag adorned with the aspiring knight sorcerer Ocoho! 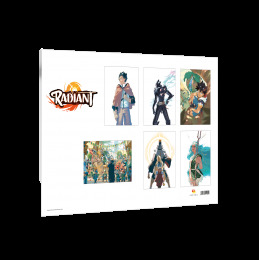 Piodon, Santori "Le Pic", Ullmina Bagliore, Vérone, Queen Boadicée, Ocoho, and Dracoon will be fighting for a place on your walls. Where they go is up to you! 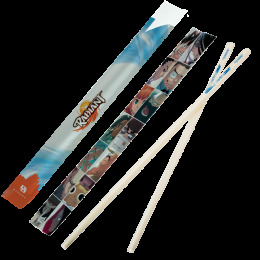 Two beautifully designed chopsticks with the Radiant branding in a manga design pouch: They're a must-have for any fan!